UPDATE: This event is a success and still happening every month during Art Walk. The corner moves from time to time. Look for “Poet’s Corner” on the Art Walk map, walk by to enjoy some original words by your neighborhood poets! “The Bellingham Art Walk has long been enjoyed by many residents and visitors. The city and a local poet are collaborating to bring poetry to the streets. Downtown Bellingham Partnership, and 2013 Mayor’s Arts Award “Poet” recipient Shannon P. Laws present Poets’ Corner.This exciting new living art exhibit for Art Walk participants will be available on the corner of W. Holly and Bay Street. Come on by to listen to original poetry by stellar poets on June 5th, 6:30-8:00 to support the debut of this literary event. June’s Poets’ Corner is sponsored by long time residents and art supporters Bert Monroe and Charles R. Dyer. While sharing poetry in the streets for the SPOKE N’ WORD MOBRolls event last month, Bellingham’s Art Walk was also in full swing. Downtown was full of people. I loved it! The experience was so enjoyable I asked the Downtown Association if they would be open to a Poets’ Corner during Art Walk. Lindsay Payne, the Art Walk coordinator, caught the vision, and now it is a reality. Special thanks to poetry lovers Bert Monroe and Charles R. Dyer for donating the money that places Poets’ Corner on the Art Walk map for June! This isn’t the first time I’ve shared poetry with strangers. In 2013 I was one of many poets reading at the Fairhaven Art Block Party. Carla Shafer had the wonderful idea of lining the two block pathway from the Lucia Douglas Gallery and the Firehouse Performing Arts Center with poet “stations.” This neighborhood event included paintings, dance, music, food/drink, poetry and a very grumpy bear. I hope one day FAB will return. The name of the event Poets’ Corner may ring a bell with some. 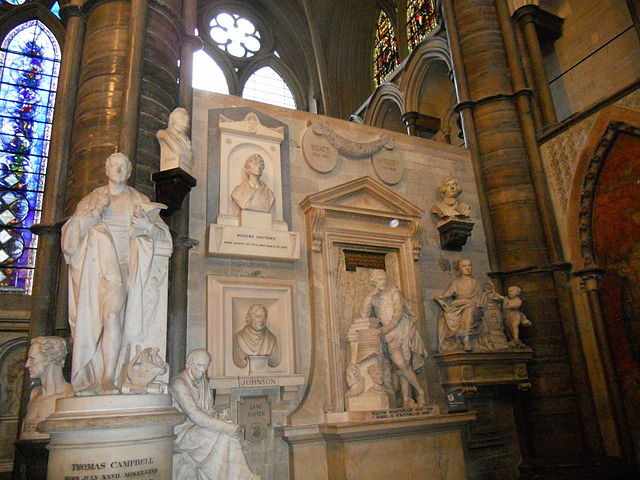 There is a famous poets’ corner in Westminster Abbey. That section of the English church received the title because of the high number of poets, playwrights, and writers buried and commemorated there. Geoffrey Chaucer, author, poet, philosopher, bureaucrat, diplomat, was the first in 1556. Robert Adam, Robert Browning, Charles Dickens, T.S. Elliot, Rudyard Kipling, Thomas Macaulay, ,John Masefield, Laurence Olivier, Alfred Tennyson, to name a few, are also buried or memorialized there. 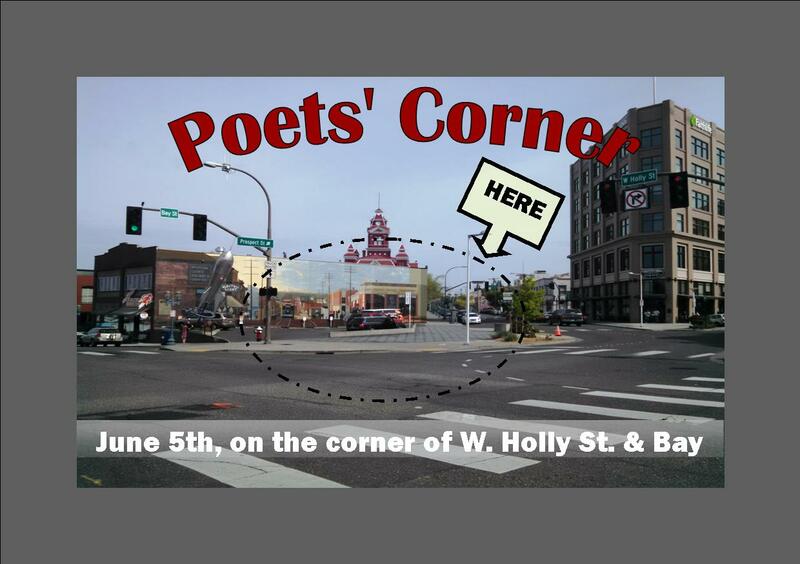 However, Bellingham’s corner will be full of LIVE poets, moving, walking and talking!